As far as I know, there are two versions of pork ribs tea. 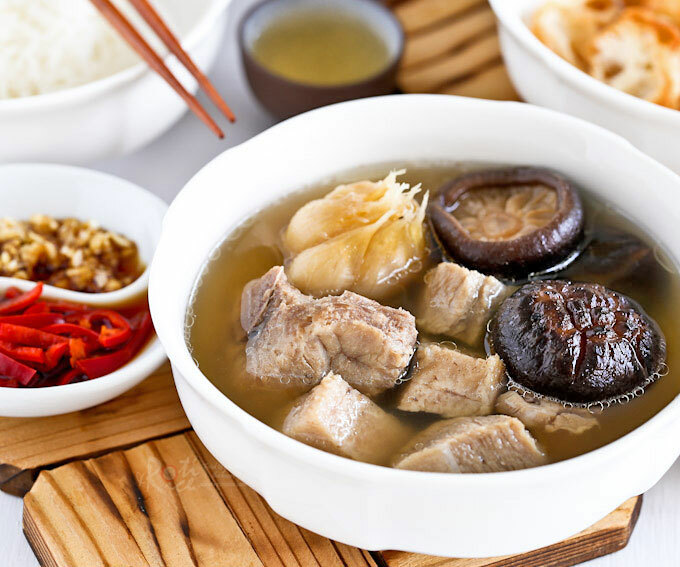 The hearty herbal Klang Bak Kut Teh is the standard in the Klang Valley of Malaysia. 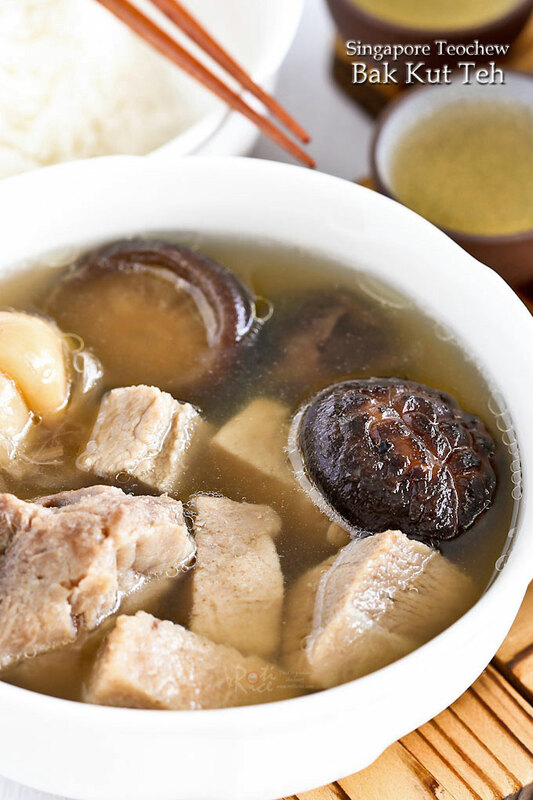 Across the Causeway in Singapore, the clear garlicky and peppery version known as Singapore Teochew Bak Kut Teh predominates. The taste is clearly different yet they share the same name. Both versions have its own following. Whatever your preference, the warming properties of either version is especially good during the colder months of the year. 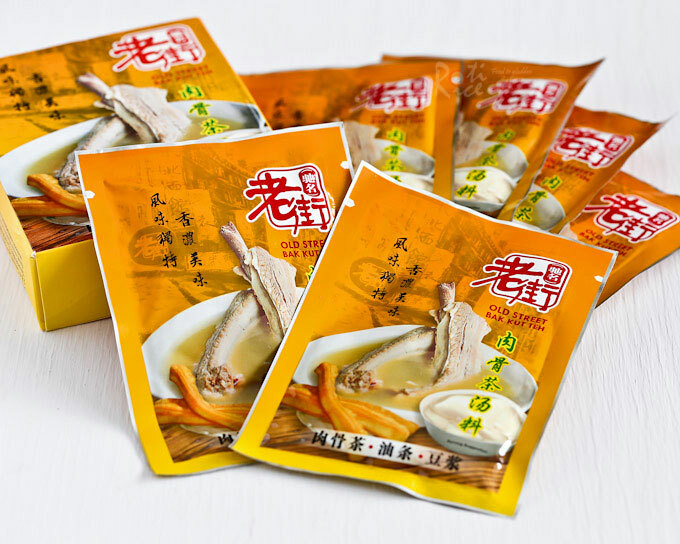 Due to its popularity, bak kut teh spice sachets are easily available in both countries. These sachets are very convenient for people who want to cook a small portion for the family. They all taste a little different because the composition of herbs and spices vary. You may have to try a few brands to find the one that suits your taste buds. 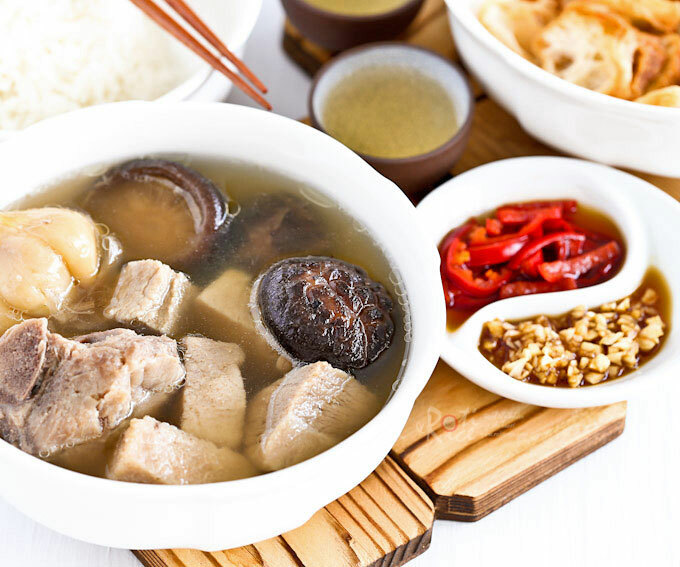 Not long ago, a family friend in Singapore gave us a 6 sachet box of “Old Street Bak Kut Teh”. I was eager to give it a try as I have never cooked Singapore Teochew Bak Kut Teh up until now. The instructions on the back of the packaging was very simple. 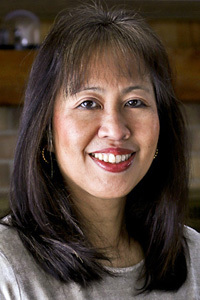 They suggested 1 sachet of spices with 1 kilogram (2.2 pounds) pork ribs, 1 bulb garlic, and 1.8 liters (7.5 cups) water. From experience with using spice sachets, I knew I should make the soup a little more concentrated. Hence, I used 2 sachets of spices with 1.4 kilogram (3 pounds) pork ribs, 1 bulb of garlic, and 2.9 liters (12 cups) water. I also added 12 dried Chinese mushrooms and a half teaspoon of crushed peppercorns for greater oomph. It turned out to be really flavorful. In case you would like to make it from scratch, the ingredients listed on the box are white pepper, black pepper, salt, garlic powder, and seasoning powder. A quick check on the internet revealed that many simply use just crushed white peppercorns. Some add a few slices of dried licorice root. Others drop in one or two star anise. I personally could not detect any hint of these spices in this particular brand of spice sachet but like I said earlier, the spices do and may vary. You will have to play around with the spice combination to get it to your liking. A good thing to do to keep the broth clear is to blanch the pork ribs for a few minutes until the marrow juices are set. Then rinse off the fat and marrow bits before putting them back into a fresh pot of water. This will reduce the need for skimming while it simmers on the stove. Wash and soak dried mushrooms in hot water for 30 minutes. When rehydrated, drain, and cut off stalks. Fill a large pot half full of water. Bring to a boil. Add pork ribs. Allow it to blanch for 4 to 5 minutes. Remove with tongs and rinse in cold water. Discard water left in the pot. Rinse out pot and fill with 12 cups (2.9 liter) of fresh water. Bring to a boil. Add blanched pork ribs, bak kut teh sachet, garlic bulb, mushrooms, and peppercorns. Bring water back up to a boil. Reduce heat to low and allow soup to simmer for 1 hour. Skim off any scum appearing on the surface. Add salt to taste. Turn off stove. 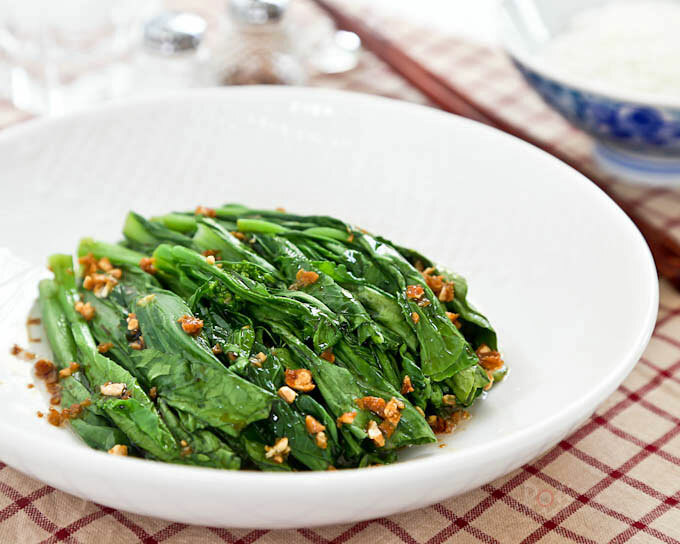 Serve with steamed rice, yew char kway (a.k.a. as you tiao or Chinese crullers), cut chilies and minced garlic in soy sauce. Singapore Teochew Bak Kut Teh is best served with garlic flavored steamed rice, yew char koay, and cut chilies and minced garlic in soy sauce. I also served it with a side of Yu Choy Sum. It has been really cold here these past two weeks and I am so glad I still have four more spice sachets. I will probably add some ki chi (goji/wolf berries) in the last 10 minutes of cooking the next time.